Thank you Travel and Leisure Magazine for featuring Langkawi Yoga! “There are plenty of Yoga retreats around southeast Asia, but this one seeks to combine improving your asanas with the great outdoors. It also takes a relaxed approach. “A yoga retreat, but a holiday too” is how Dorothy Ang, co-founder of Langkawi Yoga, describes the five day program aimed at novices near gurus and everyone in between. Held at a small resort nestled amid rice paddies, in the middle of Langkawi, the retreat includes twice-daily yoga classes, jungle treks, mangrove tours, massages and plenty of down time. “We spend a lot of time outdoors”, says Ang-a fact which helps students remove themselves from their daily lives. It was a combination of stubbornness and serendipity that landed Dorothy Ang in Langkawi. In 2006, the Malaysian was back home in Port Dickson with a spanking new law degree from a prestigious UK university. Just one problem: “I knew that being stuck in an office was not my style.” Resisting parental nudges to take up her vocation, Dorothy taught classes at her mother’s health club instead. Months later, Dorothy landed a job as an instructor at a Langkawi resort, and in May 2007 she co-founded Langkawi Yoga. In these few years of being a yoga instructor, I have at various times encountered people who portray yoga only as meditation or as a form of physical exercise. Therefore those who equate yoga to meditation see it in the spiritual form, whereas some think yoga is merely a form of cardio exercise like aerobics. With this I would like to introduce yoga as a guidance towards daily living which benefits you and everyone around you, whether you are seeking for spiritual fulfillment and greater happiness or a balanced lifestyle. In Patanjali’s Yoga Sutra ( The Yoga Bible ), 8 limbs or stages has been suggested for those on the quest for spiritual fulfillment. But what I want to focus on for now is only the first two limbs which anybody can relate too. These 2 limbs consist of 5 principles each. I have made a mind map to make a clearer picture. 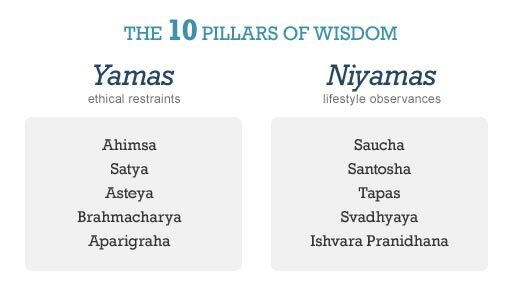 To discover the 10 pillars of wisdom which will help you to become a better person, inside and out, please scroll further. Have an awakening experience. Negative thoughts, words and actions to harm any creations of God always harms us as well. Think of the times when you were angry at something or someone, and how much energy and time is wasted doing so. Wish others well, and your heart will lighten. A hygienic body ( physical and mental ) and environment creates clarity and wisdom. For example, bathing helps cleanse the body externally whereas pranayama (breathing exercises) and asanas (physical exercises) cleanse the body internally. To add on to that, positive thinking purifies the mind. Being truthful not only to others, but also to your self. Consider both the spoken and unspoken aspects of your words. You do not have to say everything that is on your mind, especially if it is hurtful. He who has learnt to control his tongue, has attained self-control in a great measure for he will be heard with respect and attention. To have a perfect life is unheard of. Instead, finding happiness with what you have and with who you are is what contentment is. Keep in mind that this does not mean to be complacent. To be even minded, able to remain centered and clear in any situations is true contentment. Just relax into your yoga poses and realize that they are perfect for now. Similar to the verse ‘Thou shall not steal’ means to refrain from taking things, tangible ( physical ) or intangible ( reputation, energy, time, idea ) which is not yours. In this context, it is also advised that when you receive, you must also return the appropriate energy or amount. In energy and karma sense, an imbalance will be created if you take and do not pay back. To have the will, perseverance and enthusiasm to achieve a meaningful goal or to cultivate a healthy habit is tapas. But you have to ensure that all are done mindfully. Mostly interpreted as the right use of sexual energy but is actually wider than that, as the true meaning is more towards preventing the dissipation of energy through the misuse of the senses. In other words, do not be urge driven by allowing the senses to rule your behaviour. Something which disturbs the mind and body disturbs the spiritual life. Therefore learn to conserve your energy. Inquiring into your own nature and not be judgmental is self – study. Everyone is unique and what is good for one person may not be good for another. Therefore one must also understand that yoga is non – competitive. So take your time to learn within your limits. Make life simple and avoid from having greed to possess things that you do not need. In this material world of ‘wants’, it is tough for some to cultivate the freedom of wanting more and more. Acknowledge abundance and have gratitude, for if you are happy with what you have in the moment, you do not need more. Besides that, one has to learn not to get attached to anything as things come and go. So learn to let go. The Highest, is the Creator of all things in this world. Everyone has their individual believes as to who the Creator is. To be dedicated to the Creator does not merely mean that one has to perform the act of praying. It is actually as simple as being pure in your heart and actions by doing things for the greater good of the world.